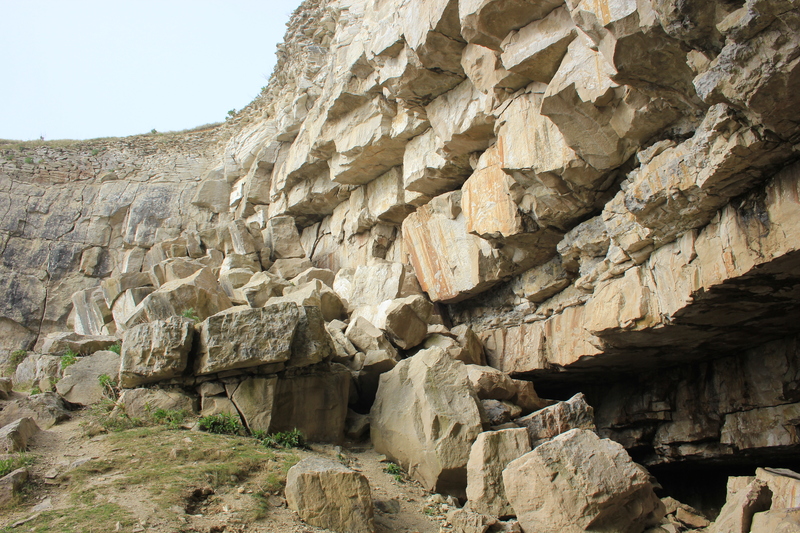 At the beginning of Stage #78 of our Coastal Path we had to walk from Worth Matravers back to Winspit Quarry. It was foggy today, giving an eerie, ghostly feel to the place. I felt as if I should be casting nervous glances out to sea, looking for abandoned ghost ships appearing out of the mist! Was it me, or did the quarry look more dangerous today than at our last visit? The massive stone blocks seemed to be being teased out of their places in the cliff by the curling fingers of fog. Even so, I couldn’t resist going back inside for a final look. I chose one of the many entrances and eyed it carefully. One block in particular, just above and to the left hand side, seemed ready to fall at any moment. One day, I am sure, I will be reading about some poor person in the newspapers who had been standing underneath one of these blocks at just the wrong time. 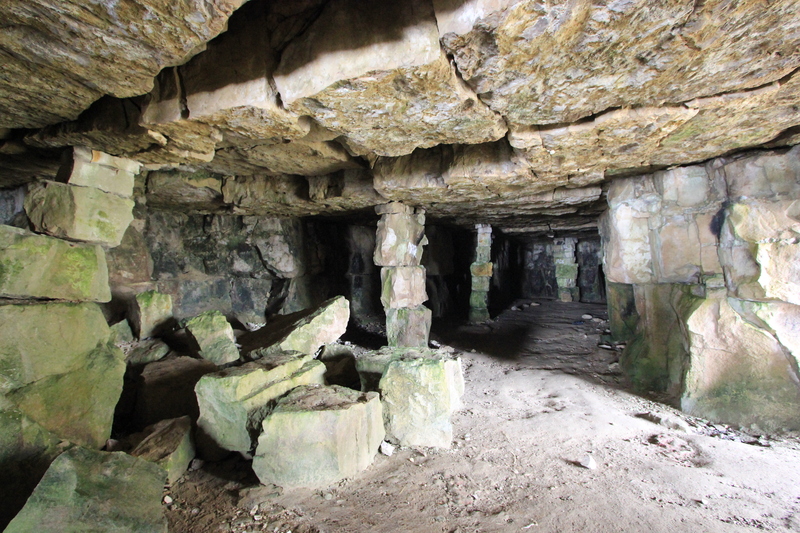 Inside the roof was not held up by the giant stone pillars hewn out of the rock which we had seen in another cave during our last walk. This time all that seemed to be holding the roof from collapsing on top of us was a haphazard arrangement of stacked blocks. It did not fill me with confidence to see gaping holes in the ceiling with a scattering of boulders on the floor underneath! Winspit Quarry is a fascinating place, but it was time to leave it. Onwards! As we left we saw a memorial. 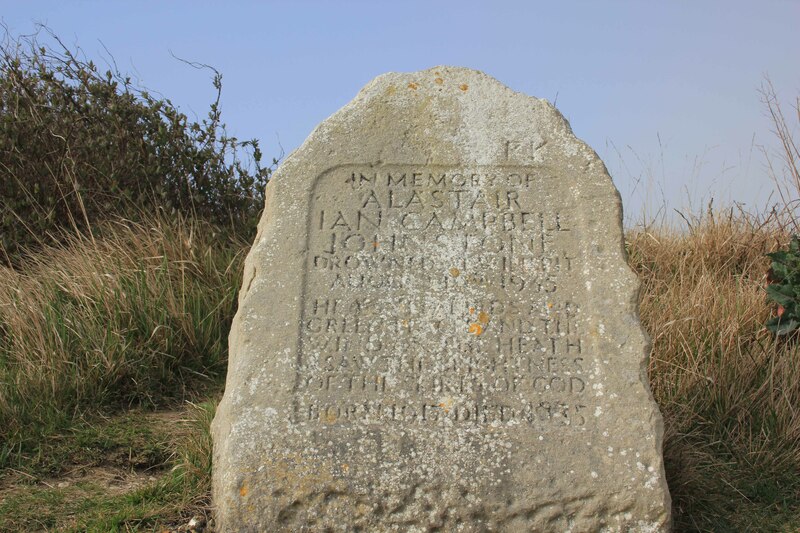 It read, “In memory of Alastair Ian Campbell Johnstone, drowned at Winspit August 19th 1935. He loved birds and green places and the wind on the heath & saw the brightness of the skirts of God. Born 1917, Died 1935″. I have found virtually nothing about poor Alastair Johnstone, save for a couple of family trees on the internet. Whoever he was, on one summer’s day in 1935 he drowned in the sea aged just 18. 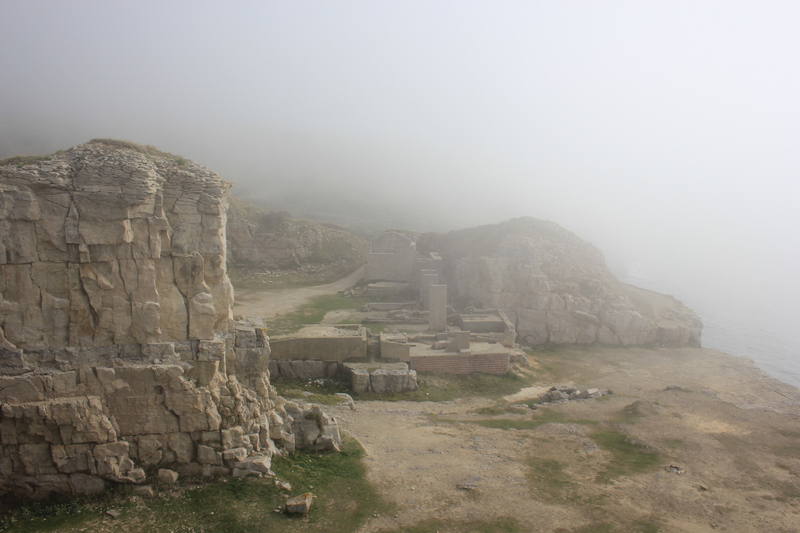 This entry was posted in Dorset and tagged coast, Dorset, quarry, travel, walking, Winspit. Bookmark the permalink. I really like the ‘foggy’ photo and ‘the curling fingers of fog’. Today, Saunders Beach is dull, with gusts of wind and rain and white caps almost to the horizon. Ditto on the ‘foggy’ photo and ‘curling fingers’ of fog! The stone blocks definitely looked precarious…. My walk on Saturday began at Winspit and then continued east. 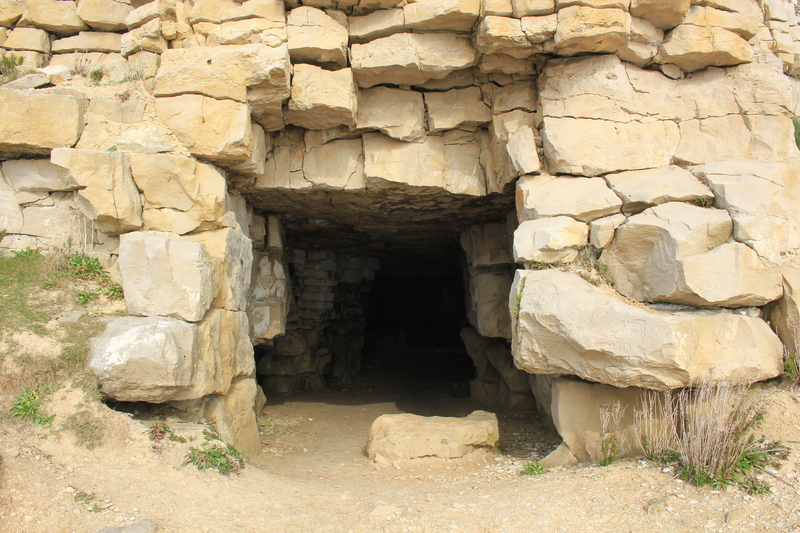 But looking back, I could see some form of cave like this and it’s great to be able to see inside through your photos now.